And it didn’t stop at that. Cleared of its forest cover, the fragile soil was left exposed to the elements, resulting in irreversible erosion that left behind a scarred landscape and destroyed habitats. Determined to something – anything – to protect what remained of Madagascar’s forests, Ochsner returned to the island in 2000. A shipping container followed her, filled with 500 kits to build solar ovens. ADES, the Association for the Development of Solar Energy, was born, and the shipping container was transformed into its first workshop. Today, two decades after she returned, ADES has grown into a 150‑person business active in nine centres across the island that has spawned hundreds more part time and fulltime jobs. The product portfolio has since expanded from the solar cooker they began with to include energy‑efficient briquette and wood stoves. It was a win‑win situation for Malagasies seeking work in one of the world’s poorest countries and for Regula Ochsner’s mission, as each wood stove saves 3000 square meters of forest per year. Rice, cassava, sweet potatoes, or beans, some staples of Malagasy cuisine, can be prepared with a fraction of the wood or briquettes needed on traditional open stoves. In addition to cutting their budget for firewood by 50%, the stoves dramatically reduce the amount of harmful smoke people, in particular the cooks, are exposed to. All in all, the national network of salesmen and saleswomen have sold 170,000 stoves, impacting close to one million people. It’s already an impressive feat, but Mama Solaire, as Regula Ochsner has been lovingly called, is not one to rest in her laurels. She wanted to find a way to reach more of the country’s 25 million inhabitants, who live spread across vast areas often serviced by poor infrastructure. The answer was a sales platform on wheels. 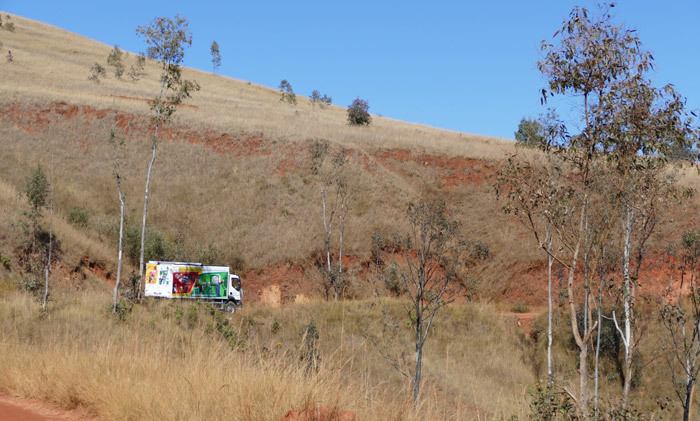 Equipped with a kitchen, dormitories, and a sales room, the ADES truck, inaugurated in 2017, travels from place to place accompanied by a second vehicle and a total staff of ten, spending a few weeks or months in a region before moving on. Every morning, two of the truck’s staff demonstrate and sell their stoves at a market, while the remaining crew members split into groups and head out to smaller markets. As part of our long‑term CSR strategy, u‑blox has been supporting ADES since 2011, and we recently renewed our commitment to the project, sponsoring three‑months of the mobile sales platform’s activity. From May to July, 2018, the ADES truck will travel from Moramanga to Ambatondrazaka to Tamatave. Throughout the journey, the team onboard expects to raise the awareness of 4000 people of the importance of environmental protection, the risks of inhaling smoke from wood stoves, energy‑efficient cooking, and a healthy diet. In total, they expect to sell stoves to 1500 households made of 8250 individuals, collectively saving 4500 tonnes of wood and CO2 emissions. One evening, after a long market day, crowds gathered and danced to music playing from the truck’s PA system. Once it was dark enough, the team working on the bus projected a documentary about the local flora and fauna and the importance of their preservation that ADES had produced for such events. Regula Ochsner says she was moved to tears when she saw the effect that the movie had on those present, many of which had rarely, if ever, watched a movie. It was one of those hopeful moments where she felt that she could see hearts and minds change. You can read more about how we are making a difference in society here. Guest blog written by Gitte Jensen, Corporate Communications Manager, u-blox.